Let’s take a lot of the cultural significance of the scorpion aside, and let’s just get this out of the way – scorpions give people the heebie-jeebies. For some, it’s because they’re simply creepy-crawly and people just have a thing about members of the animal kingdom with more than four legs. For others, it’s because of that thing they got behind them, that effective toxin-delivery system that causes all sorts of Bad Things. 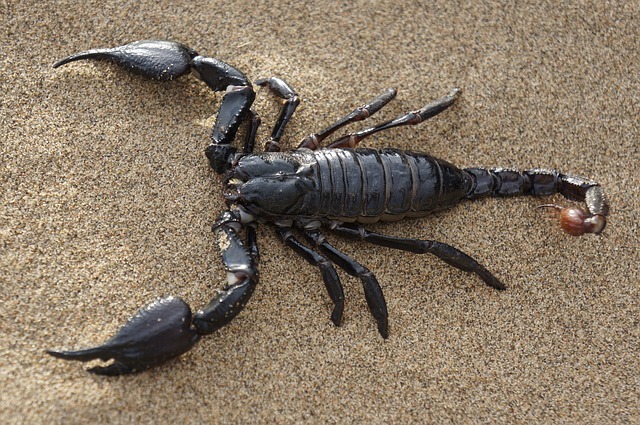 For example, according to Arizona State University’s Ask A Biologist, a deathstalker scorpion (because you can’t give cute names to venomous and poisonous organisms, I guess) can inject you with a chlorotoxin, which blocks signals from the brain telling the muscles to relax. Flex all of your muscles at once – all of them – and you get the idea, except you can’t stop it past the point of severe pain. You are now reaching for a painkiller at the end of this sentence. If you’d like to know more, here’s a very informative (and OPEN ACCESS because it’s through the National Institutes of Health) research article on what else in scorpion venom brings the pain. Before we move in, we have to consider scale: scorpions are tiny things, and while their venom is often lethal to their prey (which are often the same size as the scorpions themselves), they may not deliver enough to kill larger predators like, say humans. That isn’t going to stop it from hurting like crazy if you get stung in your toe. Then again, under the right conditions, such as having a heart condition, the chances of fatality do go up. Same goes for falling into a pit of scorpions, just in case you’ve found a way to go back in time and seriously anger a pharaoh or something, but that’s entirely on you at that point. In this week’s Featured Article (finally), Yang et al. explore yet another toxin, BmP01, and how this acts in the body in order to bring the pain. They do so because these haven’t really been explored, along with several other toxins unexplored in some species of East Asian scorpions. Hey, scorpions are often associated with the desert, but they could very well be skulking around the forest floor too, as well as almost anywhere in the planet. They reason that the target of BmP01 is the TRPV1 receptor, which is interesting in that according to Rosenbaum and Simon (2007), it is the only receptor activated by capsaicin, which is what makes pepper hot. Probably explains why scorpion stings feel the way they do. The authors also noticed something interesting: scorpion venom is somewhat acidic, around pH 6.5. Thus, the authors wanted to look into how acidity affects the action of scorpion venom, which could be an issue for people whose body pH is a touch on the low side or perhaps ; turns out that acidity makes the venom more painful (at least in mice). But wait, there’s more! With a little bit of gene tinkering on TRPV1 (because structure matters), the authors confirmed that acidity activates other ares of the receptor. So now, BmP01 can really hurt. Granted, you probably do not care about acidity or pH of scorpion venom when you get stung. What you care about is that you got stung and it hurts. Why you might care is that it gives entomologists (and people who study venom) more insights on how venom acts in the body in order to come up with more effective treatments that can work for more people, regardless of what’s going on with their bodies. You wouldn’t want to take antivenom and it turns out you’re one of the people for whom it doesn’t work or you get weird side effects from taking it. It’s the whole 5% thing. Hey, if nothing else, at least if you go hiking in a forest somewhere in eastern Asia, you know someone out there will be ready just in case your foot suddenly feels like it’s on fire. Safe hikes, casuals. Ever been stung before? By what? What was it like? Comment below or reply on Twitter @sci_jonny with #stung. Throw on a #scicomm – you’re in on the conversation now (hey, you’re engaging a science blog, that’s gotta count for something, right?). Featured Article: Yang S, Yang F, Zhang B, Lee BH, Li B, Luo L, Zheng J, Lai R. (2017). A bimodal activation mechanism underlies scorpion toxin-induced pain. Science Advances 3(8):e1700810. DOI: 10.1126/sciadv.1700810. My first day in El Paso I was stung by a small scorpion. The feeling (at first) was that of a bee sting. (I am allergic to bee stings by the way). It quickly morphed into the fires of hell on my foot with my throat clenching up and my lungs failing to work appropriately. I was sweating like a pig at that point (about 1 minute into the experience) and my heart felt like it was trying to escape out of my ears. No kidding, I felt my heartbeat in my ear canal. Thank goodness I was one block away from the Army Medical center (good old Army Housing) and the er doc lived next door. I don’t remember much after escaping outside and collapsing in the doc’s front yard. I woke up in a hospital room with my husband’s worried face looking down on me. For those that are allergic to bee stings, one scorpion sting is about equal to 25 bee stings and will bring on anaphylaxis. Fun times! See, this is exactly why people get the heebie-jeebies about scorpions. You always see cutesy clipart of bees. Ever see one for scorpions? True. My instagram feed is full of bees and wasps, even spiders, but not a single scorpion. Weird. #scicomm #stung Since I was a child I have had warts at the base of my left ring finger- or at least I did. One day I was driving to work with the window down, and a bee flew in and stung me on the face: just next to my eye. Within 48 hours (less if memory serves correctly), the wart was gone. Forever. Does anyone else have a similar experience?